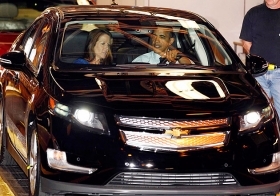 President Barack Obama sits next to plant manager Teri Quigley as he drives a Volt car off the assembly line at GM's Detroit-Hamtramck plant in July. The U.S. Treasury Department has cut its projection of taxpayer losses on the auto industry bailout to $17 billion, from $28 billion last November. WASHINGTON -- The U.S. Treasury Department reduced its projection of taxpayer losses on the auto industry bailout to $17 billion from $28 billion last November. The 40 percent reduction stems from the rebound in the auto industry, which has enabled General Motors Co. to repay $7 billion to the federal government and Chrysler Group to refund $1.9 billion, the department said in a review of the Troubled Asset Relief Program. In addition, Ally Financial, formerly GMAC Financial Services, has generated a profit this year in all four of its operating businesses, the Oct. 5 report said. “As the outlook for the domestic auto industry has improved and the estimated value of Treasury's investments has increased, the projected cost of [the Automotive Industry Financing Program] has decreased,” the report said. Beginning in December 2008 at the end of the Bush administration, the federal government bailed out the auto industry with about $85 billion in loans and stock investments. That figure includes a $5 billion fund to aid auto suppliers that has since been canceled. The report did not identify the sources of the auto industry losses. The biggest chunk of the bailout went to GM, which plans an initial public offering that will enable the government to recoup at least some of its investment. The federal government owns 61 percent of GM and 9.85 percent of Chrysler. The $17 billion lost to the auto industry is the second-biggest expected from the government's bailouts during the financial crisis, according to the report. The biggest loser under TARP has been the housing mortgage modification program, the report said. At the same time, the government has profited on a number of bank investments.The $29 billion net loss under TARP is less than 10 percent of the $350 billion in taxpayer losses once projected by the Congressional Budget Office. The biggest loser under TARP has been the housing mortgage modification program, the report said. At the same time, the government has profited on a number of bank investments.